A/B Testing consists in comparing several versions of an image, a text, or a button label, to check which one is the most efficient. These variations are presented in linear or random ways to the users of your chatbot. 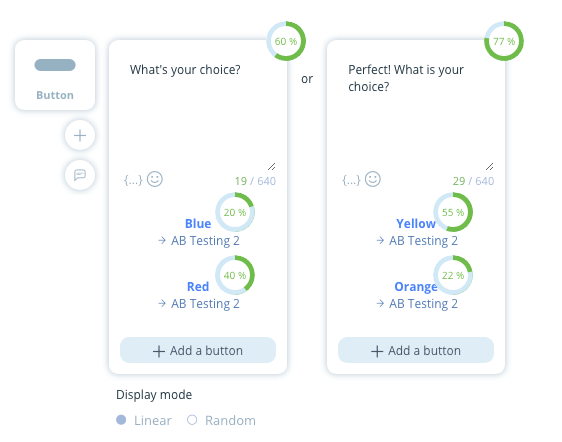 A real-time statistical analysis makes it possible to consult how effective may be various versions, according to the rate of click on actions (buttons). In other words, you can check which version triggers the most clicks, subscriptions, purchases, etc. The results of the analysis therefore can help determine the best strategy to be adopted. And from then on, you can adapt and improve your strategy to get even more optimal user engagement! This analysis underlines that the "Choice 2" button obtained a much better performance than the first button. "Choice 2" deserves to be put forward. Another option would be to replace the title of the first button with something more appealing. What elements to use in A/B Testing? 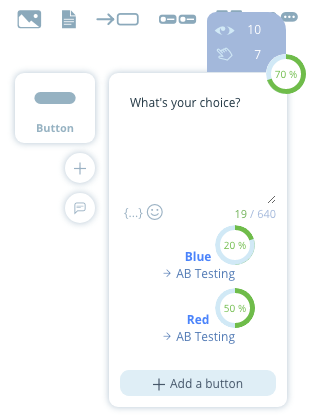 The following elements are generally used in A/B Testing: texts, images, and especially button labels, as well as quick replies. These are all elements which can be cleverly used to measure an action rate. However, the BOTNATION A/B Testing goes much further, by allowing to test a greater number of combination! To obtain this optimal tool, it is necessary to couple A/B Testing statistics with rotations. Rotations allow to alternately add several elements of the same type (text, image, video, etc.). BOTNATION will choose one of the elements to send to the user of your chatbot, according to the type of rotation (linear or random). We can therefore conclude from this analysis that a third version with the wording "Yellow" on the first button and the wording "Red" on the second button, would eventually generate many more actions. 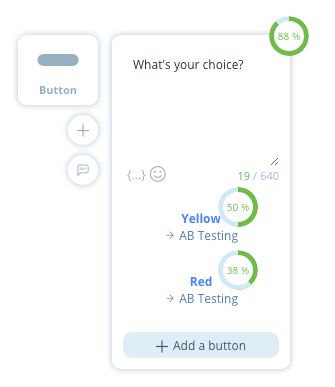 This is confirmed in a third version of the menu, which now generates 88% of actions on the buttons, thanks to an optimization linked in real time to A/B Testing statistics of BOTNATION, and the possibility to include several elements in rotation. Now that you have all this information, may you obtain excellent optimizations of your chatbot in BOTNATION!